Tom Malmquist's wife was rushed to the hospital, pregnant with their first child. Within days Karin is dead from acute leukemia and Tom was left to care for their newborn daughter. At times he feels as if he is too tired to go on and should be committed to save those around him from being scorched by his own pain and suffering. Amazing, heartbreaking and complicated, much like life itself, this fictionalized memoir is not an easy read and why would it be? It's full of raw truths that will put your heart in a vise-like grip and leave you gasping and aching to hold your loved ones close. 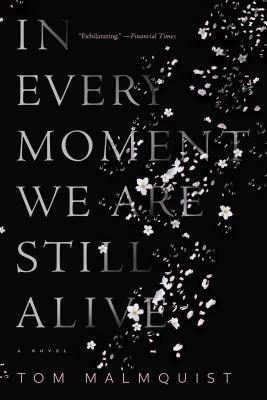 In Every Moment We Are Still Alive tells the story of a man whose world has come crashing down overnight: His long-time partner has developed an fatal illness, just as she is about to give birth to their first child ... even as his father is diagnosed with cancer. Reeling in grief, Tom finds himself wrestling with endless paperwork and indecipherable diagnoses, familial misunderstandings and utter exhaustion while trying simply to comfort his loved ones as they begin to recede from him. But slowly, amidst the pain and fury, arises a story of resilience and hope, particularly when Tom finds himself having to take responsibility for the greatest gift of them all, his newborn daughter. Written in an unforgettable style that dives deep into the chaos of grief and pain, yet also achieves a poetry that is inspiring, In Every Moment We Are Still Alive is slated to become one of the most stirring novels of the year. Translator Henning Koch translates from the Swedish. His most recent book is the bestselling A Man Called Ove.